The article below was written before the explosive events of the past week in Sweden (see http://www.socialistworld.net/doc/6327). It details the background of a dramatic turnaround in a country once held to be a model of equality and security. The anger of the most disadvantaged in Swedish society, displayed on the streets, has now hit the media world-wide. Socialistworld.net will carry further updates from Rättvisepartiet Socialisterna (CWI in Sweden). Sweden has weathered the crisis and the country is showing that slashing welfare, lowering taxes and imposing caps on government expenditure is working. That is the message from the capitalist press, think-tanks and right-wing governments around the world. The Swedish finance minister, Anders Borg, was even named Europe’s best finance minister by the Financial Times. But Sweden is no exception to the rule. Years of austerity and right-wing policies have seriously undermined the social fabric of society, while Swedish capitalism has become even more imbalanced and unstable. The old Swedish model is no more. Instead, Sweden has become a model of neo-liberalism. It has had a more rapid liberalisation than any other advanced economy in the world, in terms of privatisation and deregulation. This was the conclusion of the American think-tank, The Heritage Foundation, last year. Recently, the arch-conservative Economist magazine published a survey headlined, ‘The Nordic Countries, The Next Supermodel’. Singling out Sweden in particular, it said: “The leftward lurch has been reversed: rather than extending the state into the market, the Nordics are extending the market into the state”. It described the process, triumphantly, as a “silent revolution”, where the welfare state has been dismantled, private companies run schools, elderly homes and nurseries, and transport is fully deregulated. This ‘silent revolution’ has transformed Sweden to such extent that “Milton Friedman would be more at home in [the capital] Stockholm than in Washington, DC”, concluded the Economist. The profound changes taking place in Sweden over the last 25 years are more accurately described as a counter-revolution against all the social gains made in the past. It was the social-democratic government of the late 1980s that started what is known in Sweden as the “the system change”. Since then, regardless of which party or parties are in power, this massive onslaught on the public sector has been combined with deregulation and privatisation, so-called market-oriented reforms. Unlike most European countries, Sweden experienced a recovery after 2009, with annual real GDP growth reaching 6.1% in 2010 and 4% the following year. However, this followed the largest drop in modern times, when GDP fell by 5.5% in 2009. Unemployment is still high, 7.5%, and long-term unemployment has increased to 30% of all unemployed, much higher than in 2006-08. Last year, workers experienced a 0.4% fall in real wages. The crisis of 2008-09 hit Sweden hard, but for several reasons it was relatively short-lived and was mainly restricted to the industrial sector, which is heavily dependent on global investment and trade. In 2009, industrial production dropped by 20% and investment fell by 23%. Tens of thousands of industrial workers lost their jobs. The service sector was less affected thanks to household spending fuelled by tax cuts for those in work and the continuation of the credit boom. Yet, even in the course of the crisis, household debts increased and people were prepared to take loans to buy a house or flat as housing prices increased by 7% in 2009. From 2006 to 2010 the right-wing government – a coalition of four traditional bourgeois parties led by the Moderates (the Swedish Tories) – cut taxes on wages four times (by roughly €7 billion, 2.4% of GDP). It has also reduced corporate and payroll taxes, lowered the property taxes and abolished wealth and heritage taxes. These tax cuts benefitted the rich, above all. Nevertheless, they did act as a stimulus to the economy, damping the effects of the global capitalist crisis of 2007-09. However, the government’s intention was also to buy popular support, sow divisions within the working class, and force the unemployed to accept low-wage and insecure jobs. Tax cuts for the better off were accompanied by draconian cuts in unemployment benefit and sick pay. Sweden became one of few countries where pensions are taxed at a higher rate than wages. There was another motive behind the government’s policy: to weaken the trade unions. The first decision the government took after coming to power in autumn 2006 was to make severe changes to the unemployment benefit funds, which are controlled by the unions in Sweden. From 1 January 2007 the contributions were increased considerably and tax rebates for unemployment benefit fund payments and union membership were abolished. This was followed by other decisions which meant an even greater difference in the various contributions paid to unemployment funds – the higher the unemployment figure among members in one union, the higher the contribution. The government aimed to make it too expensive to be a trade union member and to smash the links between union membership and the unemployment insurance. This is one reason why Swedish trade unions lost 273,000 members between 2007 and 2011, and why the level of unionisation has fallen to 70%, compared to 85% in 1993. The recovery after 2009 was driven largely by an increase in exports as global demand started growing again, in particular for capital goods – engineering products comprise more than half of Sweden’s exports – and commodities such as iron and steel. Sweden sends most of its export to Germany and Norway, two countries that have experienced growth over recent years. Swedish capitalism also benefited from the boom in China and other Asian countries: Asia now accounts for 13% of Swedish exports. But Europe is still by far the biggest market: more than 70% of Sweden’s exports go to European countries. Since then, the economy has stagnated, while unemployment is on the rise, reaching 8% in January this year. Youth unemployment is much higher. According to the United Nations Regional Information Centre, in March, Sweden had “the highest ratio of youth unemployment vs unemployment in general in the OECD. Unemployment among the under 24s in Sweden is 24.2%, or four times the average unemployment rate”. Swedish capitalism has become over-dependent on a limited number of products, while reliance on global demand has made it more imbalanced and dependent on short-term events. Owing to industry’s dependence on foreign markets, it is inevitable that the particular problems in Europe will affect exports. This year, Sweden will be back to sluggish growth, at best 1-2%. At the same time as export growth slows, building and construction is almost back to the same difficult situation as in the crisis year, 2008. Private consumption and the expansion of the private service sector can no longer give the same boost to demand and growth. This is due to several reasons. Firstly, rising unemployment and inequality; over the last 18 months, the number of redundancies in industry has doubled. Further cuts in social spending mean further job losses in healthcare and education, for example, and a crisis is developing in retail. In addition, reduced job security and more people in precarious work have made it easier and cheaper for the bosses to sack workers. It is also the result of the right-wing policies and austerity measures that have been implemented. The present Swedish government must be regarded as one of the EU’s most neo-liberal and hawkish. ‘Fiscal discipline’ has become a law that requires a budget surplus equal to 1% of GDP on average over the business cycle, combined with a system of annual expenditure limits. Government spending, relative to GDP, has been falling for many years (under the present government, from 52.9% in 2006 to 51.8% in 2011), while infrastructure is in a state of decline. Over the last 25 years, Sweden has spent less than the European average on operating, maintaining, and investing in infrastructure. For example, railroad operations and maintenance receive far below the EU average. Even local governments’ budgets have to be balanced, meaning annual cut-backs. These harsh policies undermine the domestic market and reinforce the present trends towards greater inequality. “Eurostat said recently that, after Bulgaria, Sweden had the second biggest rise in the percentage of its population deemed at-risk-of poverty”, wrote Reuters (21 March 2012) in an article headlined ‘Swedish Equality Fades Away As Rich Get Richer’. The other side of the coin is that the number of US-dollar millionaires in Sweden reached a record level last year – 61,000 individuals. There were ten Swedes on the Forbes magazine’s ‘Richest People in the World 2012’ list, despite Sweden having only 9.5 million inhabitants. In 2012, the combined wealth of the 119 richest Swedes equalled 40% of the GDP. The gap between rich and poor has never been greater. Household disposable income will experience a modest growth, at best, while wage growth remains subdued. It is unlikely that the government will implement any further tax cuts – apart from lowering corporate taxes, that is. Private and household debt has reached alarming levels. Household debt surged to 170% of disposable incomes last year, compared with 90% in 1996. According to the OECD, Swedish house prices were overvalued by 30% in relation to income. When unemployment rises and income weakens, households will face more difficulties servicing loans and the housing bubble will start to burst. In addition, the government is in a dead end. Its so-called ‘job-promotion’ policy is a complete failure: unemployment is much higher now than in 2006 and the employment rate is lower. Only a third of those unemployed have access to unemployment benefit, the rest have to live on social benefits, families or friends. In 2006 most unemployed people received benefits from the unemployment insurance system linked to the trade unions. The job-promotion policy has been reduced to one of creating “unskilled, simple jobs”, in the words of prime minister Fredrik Reinfeldt, in other words, low-paid temporary jobs. Already close to one-in-five workers are on a temporary contract, over a quarter of the workforce works part-time (mainly women), although most of them want to work full time. On top of all this, the present property bubble is bound to implode. Sweden has one of the most overvalued housing markets in the world, with house prices overvalued by an estimated 25-30%. 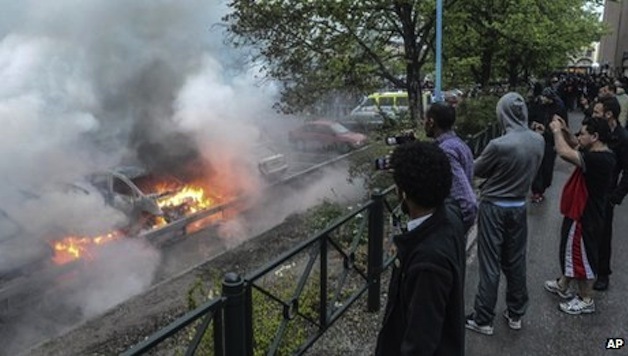 Sweden is heading towards a new crisis, while right-wing policies and neo-liberalism are becoming increasingly unpopular. The mood has turned against privatisation and the looting of the public sector by venture capitalists. The ruling coalition is losing ground and the government would be outvoted if an election were held today. But discontent with government has not turned into huge support for the Social Democrats (SAP – Swedish Social Democratic Workers’ Party). Despite the anti-governmental mood, SAP is only supported by 31.9% of voters, just a slight increase on the last election in 2010, when it won only 30.6%, its lowest vote since 1911. The lack of a genuine left-wing alternative and the low level of struggle and consciousness, has given the Sweden Democrats, a right-wing racist party, a chance to capitalise on the general mood of discontent. Its support is up to 10% – the third biggest party. Right-wing populist and racist parties exist in every Scandinavian country. In that respect, Scandinavia is a warning of what could happen if the workers’ movement is not prepared to organise a serious fight-back against market-oriented policies. Significantly, close to 80% in opinion polls want a ban on profit in the welfare sector. The opinion pendulum started to swing after a wave of shocking scandals in privately-run elderly care homes. (One fifth of elderly care, residential or home help, is in private hands.) Many scandals have been exposed, but none as horrendous as that of a home for elderly people run by Carema, a private company owned by venture capitalists hiding profits in a tax haven. A report by stockholmnews.com (11 November 2012) revealed: “A patient died due to sepsis caused by a poor management of wounds. Several significantly malnourished patients. Unnecessary amputations. A lack of supply when it comes to medical drugs. Many falling accidents. A lack of both expertise and personnel. These are some of the abuses that a doctor has reported about at the Koppargården, health and social care accommodation for elderly located in Stockholm, run by the private company Carema”. The same scandalous conditions were then revealed at other homes run by Carema and other private companies, whose aim is to make profits not provide care. “Everything is only about saving, saving, saving”, said Carema’s employees. Research also shows that staffing levels in for-profit nursing homes are lower than those in the public sector. The private companies operating in the public sector act as looters. They are paid by taxpayers’ money to run elderly homes, hospitals and schools but all the money they make is ferried to tax havens and then distributed to the shareholders. When Sweden has privatised its public services, public financing has generally been maintained while the management of the services has been contracted out. Education is another sector showing the appalling effects of privatisation, with the education system in a state of crisis. Market reforms have led to an astronomic growth in the numbers of privately-run so-called ‘free schools’ as the government aims to turn the clock back to the old socially-segregated school system which promotes a small elite. This turn towards a market-oriented education policy actually began in the late 1980s and, as with other such policies, it was supported by the Social Democrats. The introduction of a school voucher system in the 1990s meant that nearly anyone could start a school and receive public funding. Since then there has been a huge increase in the number of privately-run schools. Today, more than 20% of primary and secondary school children attend a privately-run school funded by public money. The same report concluded that private schools are seen as a safe investment for profit-hungry private equity firms. The private school sector is controlled by six private companies. The biggest of the six, Academedia, is owned by the venture capital firm, EQT, registered in the tax haven of Guernsey. Academedia has over 100 schools and 45,000 pupils in Sweden. It made record profits of over $29 million in 2010. Schools run by private companies spend less money on each pupil/student and have fewer teachers than publicly-run schools. Private schools lack libraries, canteens, school playgrounds, etc. In Stockholm you can find private schools in cellars. Instead of having access to a playground at break times, some students have had to make do with a cemetery! The introduction of private schools has increased social and ethnic segregation and an overall decline in standards. “Neither pupils/students nor society as a whole has gained from the last 20 years of deregulation”, concluded LR. Results in Swedish schools are falling behind, according to international studies, such as PISA and TIMSS, while the number of students who qualify for high-school programmes has decreased for six years in a row. The struggle against privatisation and for public welfare will shape further developments. That is why members of the Rättvisepartiet Socialisterna (CWI in Sweden) took the initiative by setting up the campaign, Welfare Without Profit, which has become a broad and genuine grassroots movement bringing together trade unionists, left activists and local campaigners. The campaign and its call for an end to privatisation and for massive investment in public welfare are catching the mood. It even got an echo within the Social Democracts, which is deeply divided on the issue. Its leaders defend privatisation and profit-run schools, elderly homes, etc, but are being challenged openly by party members. As a reflection of the change in mood, last year’s LO (TUC) congress in June 2012 decided, against the will of the leadership, to support the non-profit principle in welfare. However, after the congress, the leadership altered that to a curb on profit, which shows that the present trade union leaders are not prepared to organise a fight against the rule of capital and neo-liberalism. The battle lines are drawn in what can become one of the most important struggles in recent history. The campaign for public welfare is a struggle against decaying capitalism that regards further privatisation as an article of faith. It is a struggle to overthrow the old parasitic capitalist system and to replace it with a democratic socialist society.